Want to protect a different device? Webroot protection is quick and easy to download, install, and run, so you don't have to wait around to be fully protected. Plus, it updates itself automatically without slowing you or your system down, so you always have the most current protection. Webroot® Web Threat Shield - COMING SOON ! Detect and block online threats faster with the Webroot® Web Threat Shield. We warn you about unsafe sites before you click for safer internet browsing. As part of your Webroot subscription, you can securely create and manage logins and passwords with LastPass, the leader in secure password management, from any internet-connected device. Work, shop, bank, and browse the internet securely. 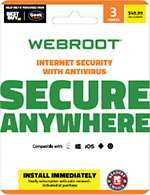 Webroot protection keeps you secure on your Android™ mobile device, so you can click (or tap) with confidence. Work, shop, share, bank, and browse the internet securely. The SecureWeb browser app blocks malicious websites, so you can click (or tap) with confidence. Open the email we sent you on the device you want to protect, and click the link to get specific installation instructions for that device's operating system.